The Edmonton Oilers will have a different look off the ice next season after announcing multiple changes to the club’s Hockey Operations department on Tuesday. Keith Gretzky, 49, was named the team’s Assistant General Manager, replacing Bill Scott who previously held the position. Gretzky has spent the last five years with the Boston Bruins and has served as the team’s Director of Amateur Scouting since 2013. Bill Scott will transition into a role as the club’s Director of Salary Cap Management and Assistant to the President of Hockey Operations. 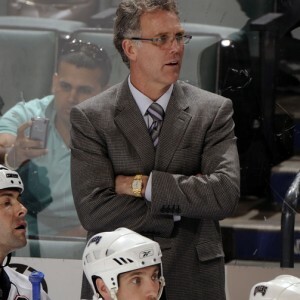 Scott spent the last two years as the team’s Assistant General Manager after being promoted from his position as General Manager of the Oklahoma City Barons of the American Hockey League (AHL)- the Oilers’ former minor league affiliate. Kelly Buchberger, who spent 12 years as a player with the Oilers, is now the team’s Vice President of Player Development, while Duane Sutter is now the club’s Vice President of Player Personnel. The Oilers have also added scouts Frank Jay and P.J. Fenton to the team’s Amateur Scouting department. Andre Brin has been hired as the club’s Manager of Hockey Communications and Research, while Shawn May is now the Manager of Hockey Communications and Media Relations. In addition, the Oilers have promoted Justin Mahe to the Manager of Hockey Analysis. Scott Howson, the team’s former Senior Vice President of Player Personnel has left the club to pursue other opportunities and the contract for the club’s Analytics Consultant, Tyler Dellow, was not renewed.